Jumbo mortgage borrowers typically have a stronger financial profile. Jumbo borrowers usually put down more cash to buy their homes (the National Association of Realtors notes that 60% of jumbo borrowers put at least 20% down). Moreover, they usually aren't first-time homebuyers, they earn more money, and they are more likely to be well-established in their careers. Investors are seeing opportunity in purchasing these mortgages. Jumbo mortgages are not subject to the fluctuations of Treasury yields. 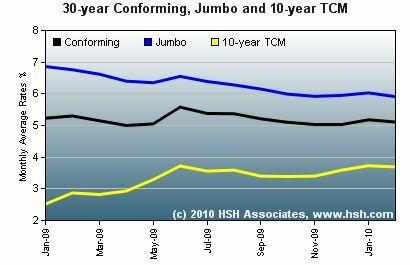 Financial Web site SeekingAlpha.com explains: "The declining spread between jumbo and conforming loan rates is a very good sign that private capital is returning to the mortgage market. The Fed is only buying conforming mortgages, not jumbos, so jumbos have been outperforming conforming mortgage-backed securities (MBS), which in turn suggests that private capital has been actively seeking out the higher yields on jumbos. That is also an indication that when the Fed stops buying MBS at the end of March, there is no reason to expect mortgage rates to move significantly higher." That being said, the gap between jumbo and conforming rates could close by 0.25% to 0.5% in the next year. You may not want to wait a year for improved jumbo financing. While today's jumbo mortgage rates have dropped, you might be able to do better. Check your area's conforming and FHA loan limits. First, if you live in a designated "high-cost area," you may be able to get a "jumbo conforming" or FHA mortgage with a lower interest rate. Conforming mortgage limits in these "high cost" areas range from $426,650 (Providence, Rhode Island) to $721,050 (Honolulu, Hawaii), and FHA limits may be even higher in some locations. For example, in Alameda County, California, FHA's loan limit is $729,750, while Fannie Mae's is only $625,500. Remember too, that if you have a duplex, triplex, or fourplex, your limits are considerably higher. Look into jumbo hybrid ARMs. Fixed jumbo 30-year mortgage rates have always been relatively high in comparison to adjustable-rate mortgages (ARMs). That being said, hybrid ARMs -- a loan which features a fixed interest rate for the first several years before converting to a rate that adjusts each year thereafter -- have been perennially popular with jumbo borrowers. On a $625,000 mortgage, you may find a 30-year fixed jumbo interest rate at 6%, while you can get a 5/1 hybrid ARM for 5.25%. The ARM offers a monthly payment of $3,451 in the fixed years of the loan, $296 less than the 30-year payment of $3,747. Over a five-year period, that's a savings of nearly $18,000. Mix it up. Some borrowers are refinancing one loan with two loans. They combine a conforming first mortgage with a second mortgage. You'll first have to do some calculations to see if this makes sense for you. Say the homeowner with that $625,000 jumbo mortgage lives in Baltimore, Maryland, where the conforming loan limit is $494,500. They can get a $494,500 conforming mortgage at 5% and a second mortgage of $130,500 at 8%. The weights of each rate can be calculated as follows: $494,500 is 79.12% of $625,000, and $130,500 is 20.88% of $625,000. The blended rate on the total package is 5.63%, or 5% multiplied by 79.12%, plus 8% multiplied by 20.88%. But that's not all -- home equity loans are typically cheaper to originate than traditional refinances. So if you save 2 points on that $130,500, that's another $2,610 in your pocket. Remember risk-based pricing. If it has been awhile since you shopped for a mortgage, keep in mind that the advertised interest rate on a conforming refinance isn't necessarily what you'll be offered. Fannie Mae and Freddie Mac have adopted risk-based pricing models, meaning that -- unless you have a very high credit score and a very low loan-to-value ratio -- the rate you qualify for on a conforming mortgage might not be any better than what you'd get from a jumbo lender advertising refinance rates. Refinancing a jumbo mortgage can be a bit more complicated than refinancing a conforming home loan. On the other hand, even a small percentage shaved off the rate can mean greater dollar savings on these larger loans.